There are people who are gifted of the ability to see the future and experience events before it happened. Recently, we also featured Rasha Mae Sarne from Dumaguete - she claimed that she saw the twin bombing incident in a catholic church in Sulu before it happened. After that Sulu bombing, Rasha gained more followers on her social media accounts where she posted some of her predictions and a number of which do really exist after some verified reports. Recently, she posted another horrifying prediction in her Facebook account that really happened weeks after she warned her followers for an accident that could be happen as she described into her post. 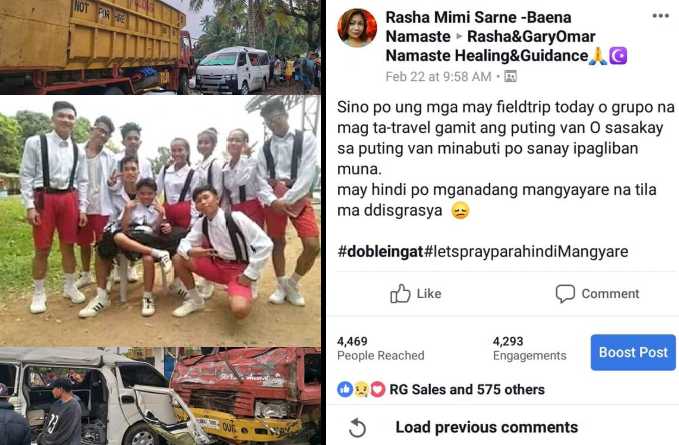 "Sino po ung mga may fieldtrip today o grupo na mag ta-travel gamit ang puting van o sasakay sa puting van minabuti po sanay ipagliban muna. may hindi po magandang magyayare na tila ma ddisgrasya." Galing ang group sa isang paaralan kase kita ko pa my Philippine flag doon sa paaralan nla, na nag paplano ma mag fieldtrip papuntang probinsya ...okay naman yung pagka alis nila pero nong papalit na sa daanan don na nangyare ang disgrasya, para nga din ako nakasakay nun sa back seat ng van, saka on ko pa ang air-con ng van kase mainit saka sinsabihan ko pa cla na wag nalang kayu umalis o ipagliban muna pero ni isa sa kanila hndi nila ako nakikita o napapansin man lang" so wala ako magawa pagkagising ko pa nga sobrang sakit ng katawan ko na para ako binugbog.. Daming pagod para akong nag aastral sa future . To the bereaved family my deepest condolences to you . May the soul of the victims rest in peace.. 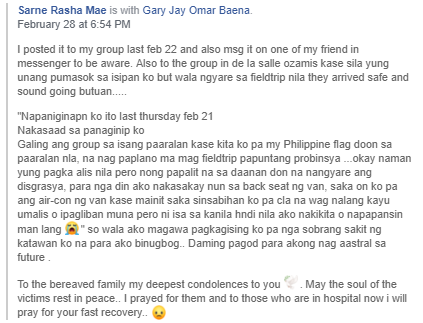 I prayed for them and to those who are in hospital now i will pray for your fast recovery," Rasha wrote as she described the incident in her Facebook post. After a week, March 1, Friday, a horrible incident happened involving six people and most of them are students were killed in a road incident in Zamboanguita town in Negros Oriental.